The quality of your soil greatly affects the success of your plants. What is the Blackland Prairie? The Blackland Prairie covers most of the Dallas-Fort Worth area in North Texas. Blackland Prairie soil consists of chalks, limestone and shale from the upper cretaceous period. This soil type tends to be dark gray to black in color, has a high pH coupled with high alkalinity. Drainage is very slow due to the soil’s dense texture. There is a layer of limestone underneath the soil that can be seen anywhere from 12-inches under the soil to just a few inches below the soil line, depending on where you live. Blackland Prairie soil is sometimes referred to as “cracking clays” due to its tendency in drought to form deep, long cracks in the soil surface. Without the proper amendments and care, erosion is also a problem with this type of soil. And, because of it’s high shrink and swell activity depending on rain and drought season, this type of soil can cause damage to home foundation, roads and other structures. While that may sound pretty bad, but our native soil does have some redeeming qualities. Blackland Prairie soil is thought to be some of the richest soil in the world, in terms of fertility. However, because of intensive agriculture and building over the years, its structure has been made more dense, leaving nutrients bound and unavailable to your plants. By amending the soil with specific conditioners and increasing bioactivity, you can turn your black gumbo into healthy productive soil. Improve your soil…your lawn will thank you! While “dirt” may just seem like an inert surface we walk on, soil is actually a living organism. There are more living organisms in a teaspoon of soil than there are people on earth! Critters such as beneficial bacteria, fungi and nematodes work to increase microbial activity, break down our tough soil, increase nutrient uptake by your plants, and create an easier environment in which plant roots can grow. 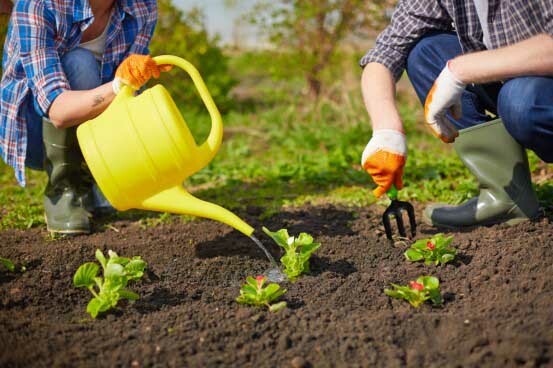 The more organic material you add to your soil, using conditioners such as organic compost, liquid compost extract, molasses, mycorrhizal fungi, earthworm castings and micronutrients, the healthier your plants will grow. Over time, as the health of your soil improves, so will the health and vigor of your lawn. Lawn roots will be able to grow deeper and denser, and the lawn will become less susceptible to pests, diseases and weather. When you feed the soil, it feeds your lawn, enabling you to phase out chemical fertilizers. As a bonus, your thick healthy lawn will be able to out-compete weeds on its own! Heal your soil with these tips HERE. Ready to make a change to your soil and increase its benefits for the long term health and beauty to your landscape? Going organic in the landscape is easy with our organic Soil Building program. It is a positive part of improving the health of your soil. Each month, we feed your soil so it in turn feeds your plants. More information on this organic landscape maintenance program here. Check out our short video on why soil is so important and why we are so obsessed with keeping healthy.